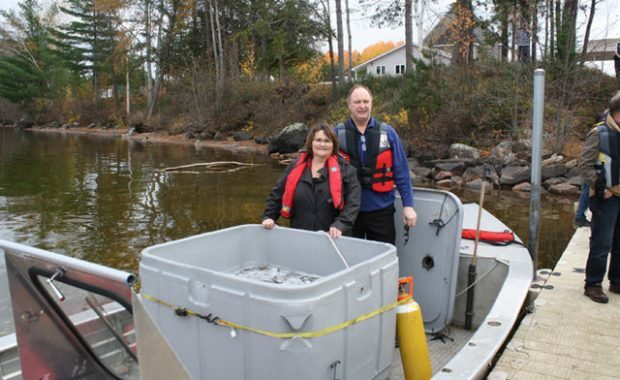 ROUND LAKE CENTRE – It was a joyous day for Round Lake Centre on October 22, as the water was filled with thousands of lake trout. 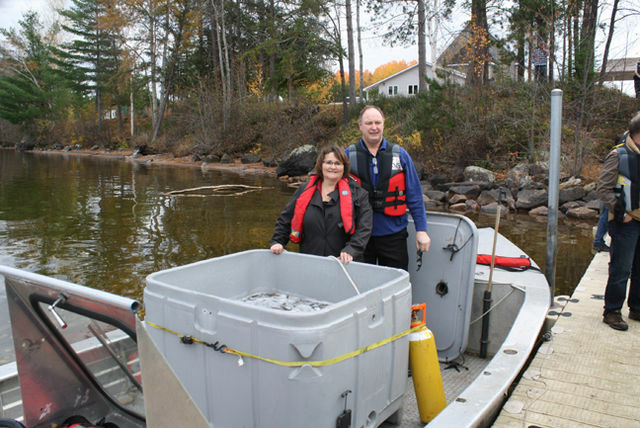 A native to the lake, the fish were taken from their swimming grounds as eggs and moved to the fish hatchery in Bancroft by the Ministry of Natural Resources (MNR). Once the fish had hatched and grown, they were purchased by the Round Lake Property Owners (RLPOA) Association, and the Township of Killaloe-Hagarty- Richards so they could be brought home to Round Lake. There were 8,500 trout in total flipping their fins in order to get a taste of their indigenous waters. “They are coming back to where they belong,” Maria Mayville, project and volunteer coordinator of KHR. population of the Round Lake trout to a higher level in the area. “Nature seems to be having a hard time looking after itself these days,” Mayville said, adding that this was the motivation for them to begin to pull the eggs out of the lake, and send them to a safe and worry-free location. In order to prevent the larger fish that are currently in the lake from turning these six-inch trout into mid-morning snacks, they let them free in water at least 20 metres deep. This project is important for not only the economy, but also for the township, with many tourists visiting the area for the fishing, it is important that they have something worthwhile to catch. It will take the trout approximately six to seven years to reach full size, which may not make them good for fishing at the moment, but give them some time and they will flourish. Mayor Visneskie had a similar mind set, and said she believes it will bring tourists, and fishermen, to the area. With the MNR doing the leg work, and helping the township financially with a bit of a boost, the RLPOA turned to the community for help. Story continues in the October 31, 2012 issue of The Valley Gazette.